Orbitz Presents ‘The Artist Showcase Series’ a group show featuring the work of noted artists: Helen Adams, Uri Chartarifsky & Glenn Fry. 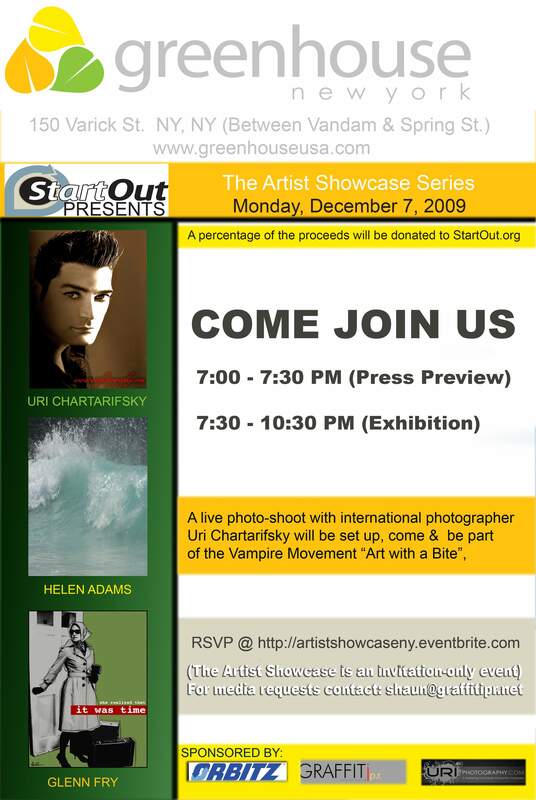 A portion of the proceeds from the sale of artwork will be donated to StartOut.org. The Artist Showcase is a multi-media extravaganza for the sophisticated consumer, affluent trend-setter, key influencers and art connoisseurs. StartOut is an non-profit organization dedicated to fostering and developing entrepreneurship within the LGBT community. It is established to connect those in the LGBT community who want to form entrepreneurial ventures, provide support for existing entrepreneurs, and connect entrepreneurs with funding, education, networks, and other external resources. For more information please visit www.startout.org.